Vietnam has a great mixture of culture, colonial and indigenous history, war history along with being a country of natural beauty. 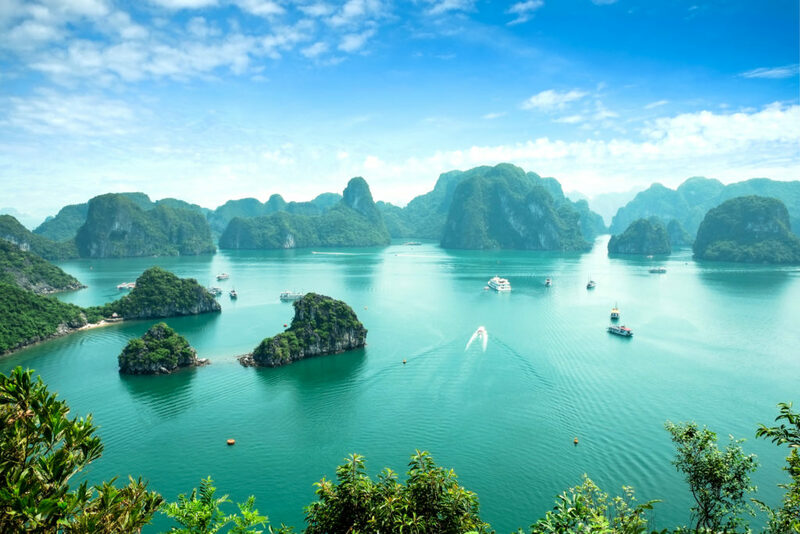 On their school trip students will be able to explore all aspects on their tour from the cultural centre of Hanoi to the World Heritage Site of Halong Bay, from mixing with Vietnamese students to exploring the battlefields. Board your flight Meet at the airport and board your flight to Vietnam. Long Tan Journey to the restricted area of Long Tan, where Australian troops fought of the Viet Cong in a gruelling battle in 1966. Visit the former Australian task force base, the Australian War Memorial and graves, as well as Vung Tau City – the port for Australian troops. Explore Ho Chi Minh Take a guided tour of Old Saigon where amongst the French Colonial splendour you will visit the Central Post Office, Notre Dame Cathedral and The Reunification Palace. University of Social Sciences and Humanities A visit to the University of Social Sciences and Humanities offers the opportunity to meet with other students and talk about the differences and similarities in each other’s lives; such as cultures, families, interests and aspirations. Cu Chi Tunnels Visit the Viet Cong’s infamous Cu Chi tunnels. During the Vietnam War these tunnels served as supply routes, hiding spots and underground living quarters containing storage bunkers, hospitals and kitchen facilities! On the move Head back to Ho Chi Minh where you will board a flight to Da Nang before transferring to Hoi An via coach. Guided Tour Explore Hoi An, a UNESCO heritage listed town on a walking tour that will take you to the Chinese Assembly Halls, Japanese Bridge and also some ancestral family homes. Cooking Class Learn to cook Vietnamese cuisine like a local with a Vietnamese cooking class at the Red Bridge Cooking School. Free time in Hoi An Today you are free to explore the town with your teacher. Check out the bustling markets, enjoy some traditional dishes at one of the local cafes, or perhaps visit one of Hoi An’s many tailor shops to get an outfit made! On the move Depart Hoi An for Hue, stopping by the Lang Co Fishing Village en route. Tu Duc Tour On arrival in Hue, visit the Tu Duc Tomb – an impressive royal mausoleum of the former emperor who had 104 wives! Hue University Visit the local university and chat with the local students. Evening Activity Enjoy a traditional music performance with your dinner tonight. Perfume River Discover Hue with a boat ride along the picturesque Perfume River. From there you will visit Thien Mu Pagoda – a 21 meter tower dating back to 1601 that has served as a meeting point for political demonstrations. Imperial City Take a tour of the Imperial City and the Royal Palace. On the move Transfer via coach to Hue Airport where you will board a flight to Hanoi, the capital of Vietnam. On arrival, meet your guide and transfer to your hotel. Ha Long Bay Journey by coach to the UNESCO World Heritage listed Ha long Bay. Made up of 1600 islands, Ha Long Bay legend says the islands were created by a great dragon living in the mountains. Take in the breathtaking scenery around you on a 4 hour cruise where you will visit the Thien Cung Grotto and Dau Go cave, as well as Hai Hing Village. Hotel Check In After your cruise return to Ha Long city and after check into your hotel. Later, discover local souvenirs and handicrafts with a visit to the local night market. Explore After returning to Hanoi via coach, take a guided walking tour through the Old Quarter. Stroll along the Hoan Kiem Lake and practice Tai Chi with the locals, visit Confucius’ Temple of Literature or brave the infamous Hoa Lo Prison complex – known as the Hanoi Hilton by the American POWs who served time here after being captured during the Vietnam War. Evening Activity Enjoy a traditional water puppet performance, this practice has dated back to the 11th century. Discover Ho Chi Minh Visit the Ho Chi Minh Mausoleum complex, along with the Presidential Palace and the Stilt House where revered leader Ho Chi Minh lived on and off during his term of office. Head home After lunch, transfer to the airport to board your flight home to Australia. Thank you for your interest in our WorldStrides Lasting Impressions – Vietnam Tour! Please tell us a little more about yourself so we can get you sent to the right place.